A portfolio of six of my photographs has been reviewed by a Guardian picture editor and are featured on the Guardian Camera club website! I recently got Adobe Photoshop Lightroom and it’s fantastic! I’m in utter love with this program. It affords me huge freedom and ease to edit my pictures, with the kind of functions I’ve always dreamed of. 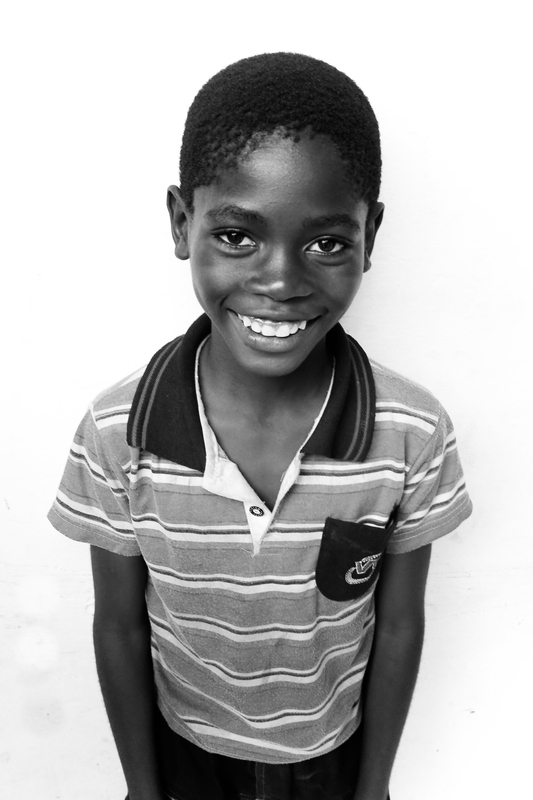 I’ve edited this picture I took of a happy chap in the Democratic Republic of the Congo this summer, from a somewhat flawed, colour shot to a very clean black and white one. I played around a lot with a combination of exposure, darks, highlights, noise, camera correction and so on. I really love the exaggeration of highlights on the forehead. What I love about Lightroom so far (I got it last night) is the endless ability to make very substantive changes to a picture without compromising quality. I love the ability to adjust the black of a shot, to reduce noise and increase detail. I have so far found it incredibly fast, and without the long waits when developing in traditional Photoshop that we’re become accustomed to. Will post more results of my experiments with Lightroom soon…. Rankin. Cheka Kidogo (‘Laugh a little’). Portrait and fashion photographer Rankin visited the DRC in 2008 to capture the faces and smiles of refugee camps in the country. 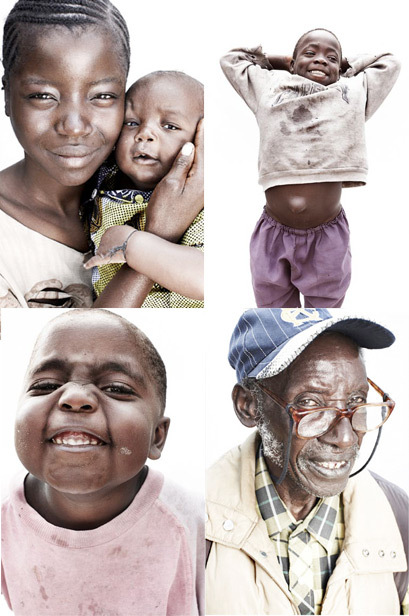 The resulting exhibition “Cheka Kidogo”, Swahili for “laugh a little”, also now an Oxfam calendar, comprises of beautiful, wonderfully heart-felt portraits. Here are some of my personal favourites…. “Cheka Kidogo”, for me, is portrait photography at its very best. Beautifully simple portraits (ie. Rankins trademark white backdrop) with bags of character crucially aimed at raising awareness of an important appeal. I think what is so striking about these portraits, Jasmine, a young girl, Tumanini, a tailor, is that they defy the style, the feeling of traditional photography of war and disaster victims. The people in these photographs really shine through as individuals, with humour and warmth. Photo Essay, Faces of Kinshasa. My favourite thing to photograph are faces. I like people. Often I think its people who make the picture. A famous photographer once said, he found faces the most interesting thing to photograph, because for him, the human eyes are like lakes and the nose and contours of the faces like roaming hills. I love to photograph faces because their so alive, they express something pure, something of the truth of the subject. The creases of our faces give us up. Here are some of my favourite faces from my recent trip to the Democratic Republic of Congo with non-profit Menelik Education. DRC Shots Made into Menelik Postcards. I am very proud to say that three of my photographs from a recent trip to the Democractic Republic of Congo with non-profit Menelik Education have been made into postcards! Here are the choosen photographs. I met Sifa in the DRC this summer, of the numberous I took of my friend, I really think this portrait manages to capture a little of her very kind, warm and friendly nature. Sifa, 18, has recently finished her baccalaureate and this october, with the continued support of Menelik Education, started a degree in International Relations at the protestant University of Kinshasa. She lives in and amongst the lively village-like bustle of Mama Jacquis compound, a safe haven for many, with her mother and younger brother Patrice. These are some of my photographs from a recent American Football match at The University of Birmingham, between the victorious Birmingham Lions and the Loughborough Aces. This first shot was taken at Moor Street station on Saturday while I was out and about in Birmingham taking photographs for Redbrick, the University of Birminghams’ student newspaper. I seem to have a growing love for transport photography, I really like the look and feel of how a lot of train stations, in particular, photograph, and undoubtedly I also really enjoy taking candid portraits of passengers, here are some of my transport related photographs from the last year. Kids Adventure, Volunteering Fair, University of Birmingham. Kids Adventure is a student-led project at the Univeristy of Birmingham (UK), which offers children from difficult backgrounds weeks of fun, love and attention. This summer I spent two fantastic, piggyback filled weeks on Kids Adventure where our kids got the chance to do everything from rock climbing and swimming, to making pizza and going to a theme park. The impact a week spent on Kids Adventure can have upon a childs self-esteem and confidence is staggering. Here are some of my photographs of the smiles from the Kids Adventure stall at this years volunteering fair. Mr Sheen on the bubbles.